So, I was standing in line at the grocery store with my kids today after school when Guy announced the his first tooth was going to fall out! I was excited for him, but I was also thinking, oh great, how was this not on my radar? There is no way that the Tooth Fairy is going to be able to make it to the bank to get a $1 coin at 4:15pm. Please don't fall out tonight. Despite being in the "express lane," we were all standing there stalled by the man in front of us who was having trouble with the check-out. I am pretty sure it was the grocery store's machines that were malfunctioning, but nevertheless, it was irritating. And while we waited, Guy continued to wiggle, and wiggle, and wiggle his little tooth. He also intermittently announced his loose tooth status to everyone around us. I just accepted that his tooth was going to come out and it was going to throw a wrench in my day's plan. Sigh. The grocery store clerk finally managed to get the problem fixed and as the man in front of us (who was actually the cause of the bottleneck) was checking out he asked Guy over his shoulder, "Did I hear that you are losing a tooth?" Guy said, "Yes!" and demonstrated his tooth wiggling abilities. 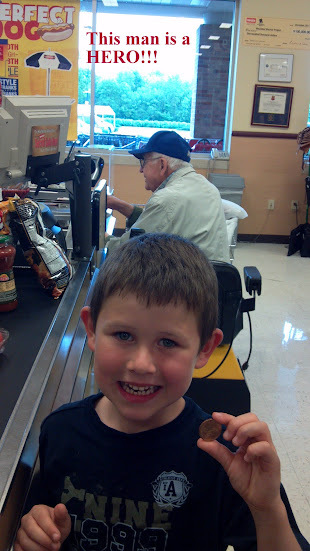 Then the man did something that won him hero-status in my book: He reached out his hand to Guy and gave him a $1 coin. He said, "The Tooth Fairy wanted me to give this to you...now you'll still need to put it under your pillow when it comes out and she'll swing by and pick it up." I had already pulled my phone out to snap a photo of Guy before his tooth fell out, so I made sure to get one of my new hero as well. PEOPLE: There is a God in Heaven...and He is intimately involved in the details of our lives. And he cares about little children and their first loose tooth and about Mommies who care about those little boys. And there are saints and angels and heroes walking around among us. Sometimes we don't recognize them, because they wear LA Dodgers caps and ride around in electronic wheelchairs, but they are definitely there. And they are listening to the promptings of the spirit, ready to step in and perform small miracles at a moment's notice. May we always recognize these tender mercies and give credit to the true source! And I am thankful tonight for a Heavenly Father who is always just a wish away and who is always willing to prove it! PS - The tooth came out about five minutes after we returned home from the grocery store. And the kids each have their own theory about how that man knows the Tooth Fairy! Oh this is absolutely lovely - what a perfect miracle that man was who was placed in your path! and how exciting for Guy to lose his first tooth! I especially loved to hear this story today as I had a similar small miracle last Friday. An old friend of mine came to visit just for a few days, we had paid to go and visit these beautiful gardens. Almost immediately I felt unwell when we got there, I ended up being pretty sick and I felt terrible because I didn't want to have to go home, my friend had travelled over 400 miles to be with me and I wanted her to have a good time and do some sightseeing together! so I pushed on and we kept walking around the gardens and then I was sick again, this time in the bathroom I offered up a small prayer and almost immediately as I left the bathroom I felt 100% better and we were able to enjoy our day! It was such a testimony to me that it's not just the big things in life that Heavenly Father cares about but he is always watching over us and ready to step in and help us out no matter how insignificant the help may seem in comparison to other things going on...but he knew it was important to me at that point in time and I'm so grateful for his watchful eye over us always as I'm sure you were today too! That's wonderful! He really does care and watch out for us!! :) Thanks for sharing that story! Oh my gosh Jocelyn, this is one of the cutest stories ever. I got chills just reading it. Thanks for sharing this it made my day! Wow! What a great memory Guy is going to have to remember losing his first tooth and the you got a picture of it to boot! Amen! I love this story. 2. Thank you for sharing this experience with us. 3. I think you were also blessed for your patience waiting in line. This is way too cool. Seriously, I especially love where you say, "He is intimately involved in the details of our lives." Sometimes we forget that as adults. Awesome! That is SO AWESOME! Thanks for sharing that story! What a great lesson! Not only is this a really heart-warming story, it is a reminder to me that I need to listen to the gentle whisperings of the Spirit. It could have been so easy for that man to do nothing - he could have been too busy with himself. Yet he was aware and was able to serve. Thanks for sharing! Awww, such a cute story. And what a sweet man (angel). Made me cry! Our Father is sooooo amazing! hahaha I love it! I think it is beautiful when something or someone that causes irritation ends up being the source of our tender mercy.